Five years ago, every American would have considered a trillion-dollar budget deficit a national tragedy. If you believe the CNBC parrot show, NOT having a trillion-dollar deficit is now a sure sign of the Apocalypse. I speak of course of the cleverly dubbed “Fiscal Cliff,” which panicked CNBC apologists are required to mention no less than 5,000 times a day. We’re told ad nauseam that going over the cliff will drag the US into recession. Here’s what we’re not told: The US has been in recession 9 of the last 10 years. 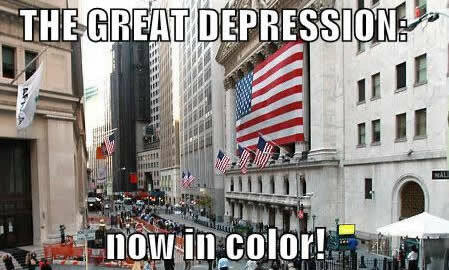 It’s in recession this year, and no matter what CNBC’s financial terrorists say or the idiots on Capital Hill decide, it will most certainly be in recession in 2013. Creating the illusion of economic growth is easy if you can print money. It’s a prank you can play on an entire country. Cut the value of the currency in half and the economy’s size will appear to double. If it doesn’t, you’re in recession (whether you know it or not). Cavemen probably understood this concept better than America’s best economic minds. The only way to accurately measure changes in a nation’s economy is to do so relative to the world (see Notes for non-nerds below before protesting). According to the World Bank, the U.S. represented 31.8% of the world’s economic activity in 2001. By the end of 2011, that share had dropped to 21.6%, meaning America’s slice of the world economy is 32% smaller than it was a decade ago, and getting smaller every day. Note that America’s housing bubble did nothing to boost the U.S. on the global stage. As horrific as these results are, they’re better than Japan’s, whose “lost decade” proved only to be prologue for its “lost-er decade.” Japan’s share of the world economy fell more than 35% from 2001 to 2011 (literally worse than Zimbabwe) and has now shriveled 54% from its peak. But Japan’s real collapse did not coincide with the bursting of its stock and real estate bubbles in 1990 and 1991 respectively. The decline actually began in 1995 when policymakers allowed government debt to exceed 90% of GDP (a milestone the U.S. quietly passed in 2010). The United Kingdom gets third place in the 2001-2011 major economies’ “Race to Oblivion”, although with a less than 3.5% share of world GDP it’s hard to call this a major economy with a straight face anymore. While the U.K. printed its way to 24% loss in world GDP, France and Brazil both passed the nation where an actual troy pound of sterling silver now costs about 235 “pounds sterling”. With government debt expected to reach 88.7% of GDP in 2012, once-Great Britain will soon be seated at the kids’ table at economic summits, if it gets invited at all. True dat, Ben….unless there’s “cost” associated with turning the nation’s currency into the world’s laughing stock…. And there you have the real New World Order (sorry Freemasons). In ten years China’s economy will be bigger than those of the U.S., Japan, and the U.K. combined. What are the chances they will drink the same kool-aid we are presently guzzling? Will they need, or even tolerate, the opinions spewed by our pundits and politicians? And more importantly, will the U.S. dollar still be the world’s reserve currency? Being a war-mongering banana republic isn’t all it’s cracked up to be, and despite what CNBC’s fast-money fuckwits may think, the stock market is not America’s report card. Wall Street is the white elephant that America can’t afford to feed anymore and China doesn’t have the slightest interest in buying (just take a look at the Shanghai Composite). Continuing to yield to its tantrums will undoubtedly destroy us. Fun Facts: Total U.S. GDP growth in the 20th century was $9.93 Trillion, while the government accumulated $5.5 Trillion in debt. In the 21st century, the US has borrowed $10.7T and has a grand total of $5.30T in GDP growth. Notes for nerds: Most of the calculations presented were derived from data compiled by the World Bank which can be viewed or downloaded here. World GDP was set to 100% and each country’s percentage determined simply by dividing by world GDP. Japan’s debt as a percentage of GDP from Fred (225% was used for 2011). Estimate of U.K.’s 2012 Debt/GDP from here. U.S. GDP stats from USgovernmentspending.com (2012 estimate adjusted for 2% growth). US debt from Debt to the Penny. Notes for non-nerds: How much World GDP changes from one year to the next depends entirely on what is being used to measure it. For example, World GDP expanded by 109% from 2002 to 2011 in USD terms, but contracted (-59%) in terms of gold. Using the Euro would produce different results (+59%), as would using barrels of oil (you figure it out). Looking at countries relative to World GDP is an honest measure of their changes. To say that Japan is still growing (at least in terms of Yen), but everyone else is growing much, much faster in terms of Yen distorts the reality that Japan is undeniably shrinking relative to the world (no matter what currency is used).